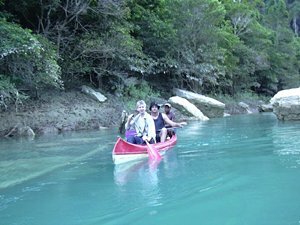 Manambolo River: The best way to reach the Tsingy de Bemaraha is to float the calm and scenic section of the river from Ankavandra to Bekopaka, far from any roads or vehicles. This trip is about remoteness, flora and fauna, and beautiful scenery, with the special romance of being on a river�barefoot sandy beaches, moonlight reflecting off the water. "River-time" is the mode on the Manambolo - no rapids, hippos, poisonous snakes, or large carnivores. A flat water float, no previous experience is required. 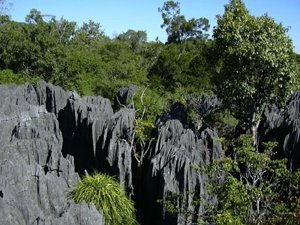 Tsingy de Bemaraha: This is Madagascar's largest reserve (152 000 hectares. ), classified as one of the world wonders by UNESCO. The fascinating raised limestone plateau is decorated with a frail, chaotic razor-sharp collection of pinnacles, the "Tsingy". Areas of deciduous forest also provide the chance to see brown lemurs and a variety of birdlife, we may also meet the rare all white Decken's sifaka. Wildlife. Spanning a great variety of ecosystems we'll have an opportunity to see a wide selection of Madagasacar's fauna: Indri Indri in the eastern rainforest of Perinet; Red-fronted lemurs and subspecies of Verreaux's sifaka in the gorges of the Manambolo River; fossa, sifaka and brown fronted lemurs in the Kirindy Forest with several nocturnal species are possible throughout the journey. Birds. The birds are a continuous source of entertainment for the expert and novice birder alike. We may see as many as 100 different species, and sometimes enjoy sightings of the very rare Madagascar Fish Eagle. Other endemics we can expect to see include: vangas, cuckoo-rollers, and Vasa parrots. Scenery. 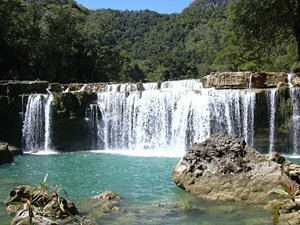 The variety of areas we visit provide an incredible scenic tapestry; from the rainforest of Perinet to the gorges the Manambolo River. The highlight are the Petite and Grande Tsingy de Bemaraha. Traveling south through the dry western forest of the Kirindy Forest and just before reaching the coastal town of Morondava we spend time at the world famous Avenue of Baobabs. Culture. On the river and roads we pass isolated hamlets and small villages, where the local Malagasy cultivate rice, cassava, and bananas, and keep cattle. We have the chance to meet and exchange the news, and perhaps buy some fresh fruit. At times enjoy local musical gatherings in some villages or along the river. Camping. Campsites on the Manambolo are usually large sandbars offering smooth clean tent sites. Bathing is a pleasure in the warm river water, and laundry dries quickly in the sunny dry air. All river and camping equipment is provided with the exception of a light weight sleeping bag. Experience the romance of East Africa. 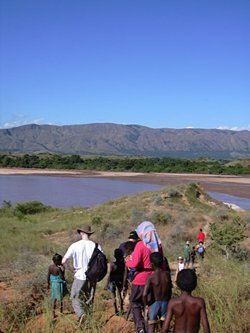 We invite you to join one of Remote River Expeditions' adventures into Madagascar, Ethiopia, and Tanzania and see the atrractions of those countries. Each trip is completely unique. 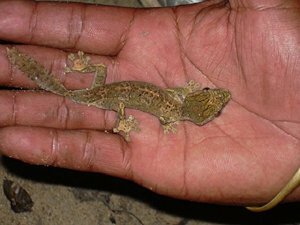 Each expedition has its own special challenges and serendipitous, human connections. What you can expect in every instance, however -- and why many of our clients return, year after year - is an outstanding wilderness experience including great food, magnificent wildlife, and friendships forged that last a lifetime.